In the late Fifties, Mal Waldron was an important member of the common-practice jazz fraternity. He gigged with Billie Holiday and Charles Mingus, was the house composer and arranger for Prestige Records, and took part in early attempts at Music Minus One. His original music was workmanlike and riff-based, much like his piano playing, and he didn’t mind writing out easy piano scores for publication. Waldron was often compared to Thelonious Monk. He didn’t play very fast, and he stated the beat in a similarly uncomplicated manner. (Appropriately, Waldron is the pianist on Steve Lacy’s freshman record of Monk tunes with Buell Neidlinger and Elvin Jones, the first album of Monk tunes not played by Monk himself.) Waldron wasn’t yet a mature artist, though. His solos displayed authentic hard-bop flavored with a taste of surrealism, but lacked the power of Horace Silver or Monk. “You Stepped Out of a Dream” on his trio album Impressions shows his early style at its most fluent. The same record with Addison Farmer and Tootie Heath contains several originals with unusual details; it’s the most complex trio music Waldron ever recorded. Around this time he also produced two ballads that have become standards, thanks to later recordings by Abbey Lincoln (“Left Alone”) and John Coltrane (“Soul Eyes”). In the early Sixties, Waldron’s laconic attitude and ease with paper made him a good fit for the emerging avant-garde—not for the completely free or atonal players, but for those like Max Roach and Eric Dolphy who were doing more measured experiments. Several sets of Dolphy and Waldron alongside Booker Little, Richard Davis, and Ed Blackwell at the Five Spot are famous. Here, Waldron’s laconicism is beginning to morph into a non-virtuosic drone distantly connected to McCoy Tyner’s modality. After a token nod at running the II/V changes, most of the piano solo on Waldron’s “Fire Waltz” consists of walking up and down a C minor ninth chord or the pentatonic scale. This solo prefigures Waldron’s mature music. He was probably encouraged by how well this new style fit with Davis and Blackwell. All three play what they play: no exceptions, no hesitations, no reactions. It’s a kind of informed and intentional ignorance. I would never dare accuse these profound musicians of not listening to each other, but listening does seem somewhere down the list of essentials, after vibe, time, and content. Of all the great Sixties jazz rhythm sections, Waldron-Davis-Blackwell is the most “world music” or “faux-African.” No one bends or adjusts, and everything remains pretty much at one dynamic level throughout. If the form gets lost sometimes (which it does, at the top of the piano solo on “Fire Waltz,” for example), you can’t readily tell from the way it chugs along. Perhaps few records with Waldron, Davis, or Blackwell—by themselves or together—are ever going to be considered heavily swinging events by the toughest jazz police. These musicians show us that you don’t have to be concerned about “fitting in” when swinging in order to be beautiful. On Waldron’s next easily accessible recording, 1969’s Free at Last (the first ECM record), everything is reduced to the drone and the riff. His touch has gotten more secure and elemental. As far as I can tell, Waldron wouldn’t really develop further until his death in 2002. Nor would he need to. While on the Fifties records he threads changes, the mature Waldron doesn’t give a damn about making guide tones connect in satisfying or surprising ways. The right hand is an incantatory shaman sitting atop the chugging, low-register left, insisting that a short stutter of melody will fit anything: any harmony, any place in the beat, any tune. If the changes are noticed, simple lines are repeated in unvarying sequence. His old solo on “You Stepped Out of A Dream” seems like Warne Marsh in comparison. Waldron’s best music also has a darker side that’s not decipherable in sense-based or spiritual terms, like H. P. Lovecraft’s unnamable. It seethes and burbles without coming to a climax, or caring if you like it or not. And not everybody likes it. 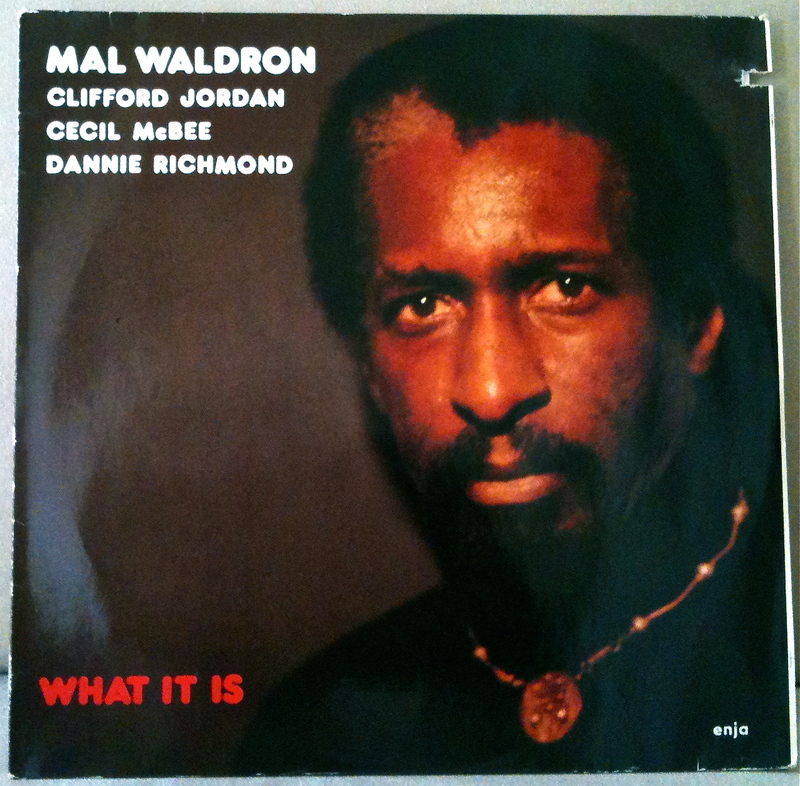 While many jazz fans have easily connected with Waldron’s emotional power, some professionals find Mal Waldron’s mature music merely amateurish, probably because it doesn’t play by the rules of sophisticated jazz. It’s certainly not that swinging, in part because Waldron frequently pushes ahead of the beat. Solo or duo I don’t really notice this. Trusted companions like Ed Blackwell and a long list of B-team drummers helpfully contextualize Waldron—with righteous authority on the one hand, and with bland incompetence on the other. I sympathize, however, with those who have heard mature Waldron collaborations with more conventionally solid, straight-ahead musicians and found the feel a bit awkward. The band on Free at Last is more on the B-team side, with Waldron having the best time of anyone present. This was regrettably a frequent occurrence: Waldron recorded too much, with too many lesser lights. I forgive him, since I’m sure that recording was a significant part of his income. The Japanese took a special interest in the Mothra of the piano; there are probably 100 Waldron records made for various Japanese labels alone. (Waldron’s first version of “Left Alone” with Jackie McLean has iconic status with Japanese jazz lovers.) In general, the quality of the other musicians present determines the quality of a mature Waldron record. If they are famous, good. If they are unfamiliar, maybe. Waldron’s duo with Steve Lacy is justly celebrated. It’s amusing to read Lacy’s description of Waldron as a master accompanist. Lacy’s right, of course, but that’s hardly the whole story: Waldron bangs his rocks together full-out behind Lacy’s impassioned and structurally perfect solos, and then, when Lacy’s done, he bangs his rocks alone in the same fashion. A notable exception to this procedure is the Ellington/Strayhorn tribute Sempre Amore, during which Waldron seems to remember that back in the Fifties he could play any genre of jazz. The comparatively gentle result is magnificent. For me, the similarly reserved concept record Hot House is nowhere near as good, although “Petite Fleur” and “The Mooche” have an appealing gloom. Those are the only studio records from this duo; the rest of their discography are live gigs featuring Monk tunes (great) and noisy originals (even better). Lacy and Waldron also worked many times with a rhythm section; again, the quality of those bands varied. Since Waldron played one way, it’s always interesting to hear musicians familiar from other contexts adjust to him. Waldron recorded duos with Marion Brown, Archie Shepp, and Jim Pepper. If you study Billy Higgins or Joe Henderson, check out One Entrance, Many Exits. Perhaps the best example of Waldron’s gravitational pull is one of my favorite records ever: What It Is with Clifford Jordan, Cecil McBee, and Dannie Richmond. I love the cover photo almost as much as the music. Waldron was extremely photogenic, and his great look undoubtedly helped him sustain a viable career playing recondite music. Everyone interested in marketing uncompromising jazz should check out a vinyl edition of What it Is. It’s obviously badass avant-garde black music that you must buy immediately. It seems like Mingus would be an obvious reference on What it Is, since McBee is going for a post-Mingus thing and everyone else worked with him. But no Mingus music sounds like this. Jordan’s blues “Charlie Parker’s Last Supper” is swinging and singing hard until the piano solo, when Mal’s stutter once again seeks what is simultaneously lurid and boring. The other two extended pieces are “Hymn to the Inferno” and “What it Is,” both simple Waldron vamps that go into free-form roils. I haven’t heard Jordan play free anywhere else, but he sounds great! Waldron usually responds to a free-form situation by playing augmented triads and diminished fifths up and down chromatically. No one else would dare, and few others would sound as good no matter what other virtuosic stuff they could do. This record also has some of the best non-Mingus Dannie Richmond I’ve heard. Waldron’s most profound drummer relationship was with Ed Blackwell. Blackwell played with very few pianists, and frankly it doesn’t always really work. For example, I admire Michel Petrucciani but don’t love his work on Joe Lovano’s From the Soul: there isn’t enough space; he doesn’t hit enough downbeats; he doesn’t riff enough. Obviously I want him to play more like Mal Waldron! Waldron’s trio with Blackwell had Reggie Workman on bass. What was hinted at twenty years earlier with Richard Davis is now fully realized. Although Workman was once a fairly straight-ahead player, by the time of the Waldron records he was a loose avant-gardist. Like Blackwell, his style won’t fit with decorative or hip modern jazz harmony. He just strums away, channeling the mystic, perhaps with less consistent excellence than Blackwell but still with real fire. Waldron, Workman, and Blackwell together are pure evil. The video of the evil trio backing Charlie Rouse and Woody Shaw at the Vanguard is a precious document. “The Git-Go” is a long mono-dynamic gaze into the chasm. YouTube: Rouse has it together (and I never heard him play on one chord before), but Shaw is simply unbelievable. Mal plays the same solo he always does. Just perfect. Great side angle shots of Blackwell’s left hand, too. The changes then continue normally. You and the Night and the Music is the only record of a piano trio playing standards with Blackwell on drums. His African-derived tom-patterns are nice and loud in the mix, as is Workman’s groaning bass. Many of my peers might find this record rather strange, and perhaps if I heard it for the first time now, I would, too. But I heard it early—the long-defunct ProJazz label somehow got their product into Best Buy in Eau Claire (probably due to a Japanese electronics connection)—and I bit that apple hard. To this day I more readily appreciate jazz that is stark, surreal, and bass-and-drums-heavy (like the evil trio) than jazz that is decorative, sensible, and piano-centric (like most piano trios). No, it’s not me. I don’t think it sounds like the way I play now, either. But I owe one hell of a lot to Mal Waldron. I had such fun imitating Waldron shamelessly! Drones, motifs, lurching rhythm, the whole shebang. Imitating someone else is usually a bad idea. This time I just couldn’t resist. Jacob Wunsch, who transcribed the Cedar Walton interview, has repeatedly asked me about Mal Waldron. Initially, I didn’t feel like responding; we don’t always like discussing our biggest influences. Now I’ve decided to fess up and record an homage. Music moves forward by confronting and reacting to the unrepentantly idiosyncratic. If you’ve never dealt with Mal Waldron, now’s the time.